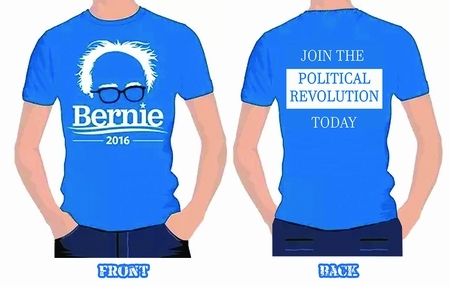 Bernie 2016-Two-Sided T-shirt! "Join The Political Revolution!" Home > Bernie Sanders for President 2020 Gear > Bernie Sanders Shirts! > Bernie 2016-Two-Sided T-shirt! "Join The Political Revolution!" Brand new! Two-Sided "Blue" Bernie T-shirt. On the front the favorite "Einstein" Bernie Sanders face with "Bernie 2016" in writing. On the back, "Join the political revolution today" in big lettering. Get it now while it's hot and let's get Bernie elected together!